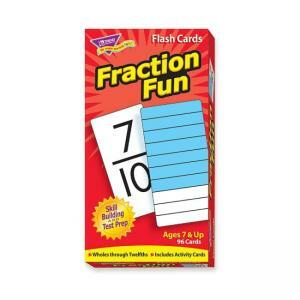 Fraction Fun Flash Cards offer a thorough way to learn and understand fractions. One side has a numerical representation, while the other is divided to illustrate the fraction. Learn wholes through twelfths with symbols and graphic cues, plus 11 cut-apart cards for manipulatives. Durable cards are self-checking, and feature rounded corners for quick sorting. Ideal for first-grade through fourth-grade (ages 6 to 10).